This spring weekend was a perfect 10 here in Atlanta. The weather was gorgeous and I even pulled out my favorite summer wardrobe staple, white jeans (before Memorial Day, GASP), for our Braves game date night on Saturday night. So between tomahawk chopping and watching basketball I was still able to sneak in a weekend project. Last week, we saw my back porch in it’s current state and all agree it could use some love. 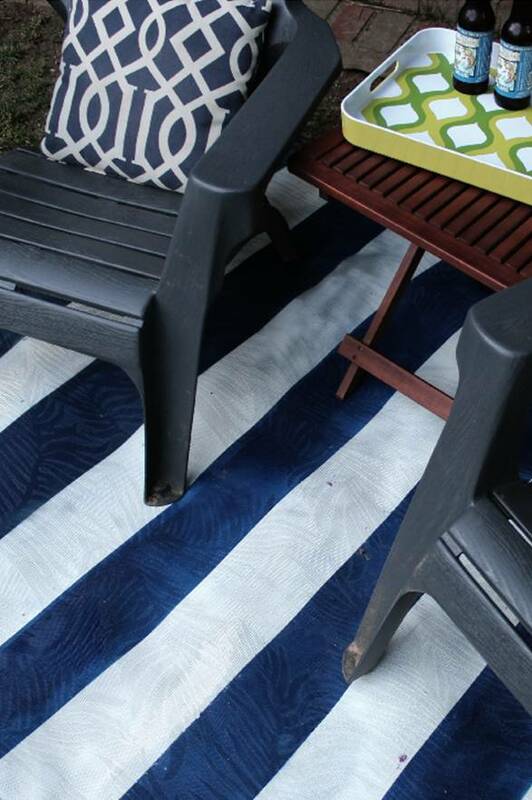 To begin giving some life to this space, I tackled a DIY Painted Outdoor Rug inspired by Ballard Designs. Can you just imagine this setting on a dock? With a lake behind it? Friends floating on some tubes? 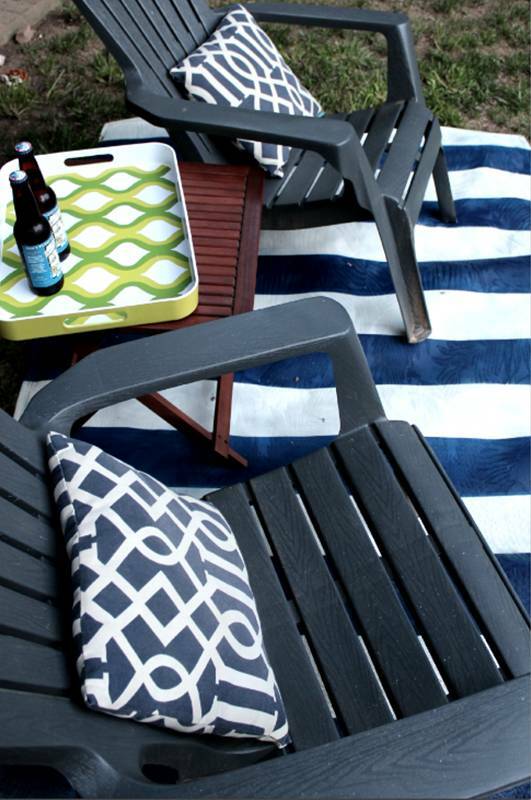 I have had my eye on an outdoor striped rug for the porch and know it would be just the thing to help anchor the space. Love these from Dash & Albert and Wayfair. (edited: sadly the Ballard version is no longer available). it is going outside, after all! So what’s a girl to do? Never fear, when there’s a will, there’s a DIY way! Best part of this DIY way? It only cost $20. 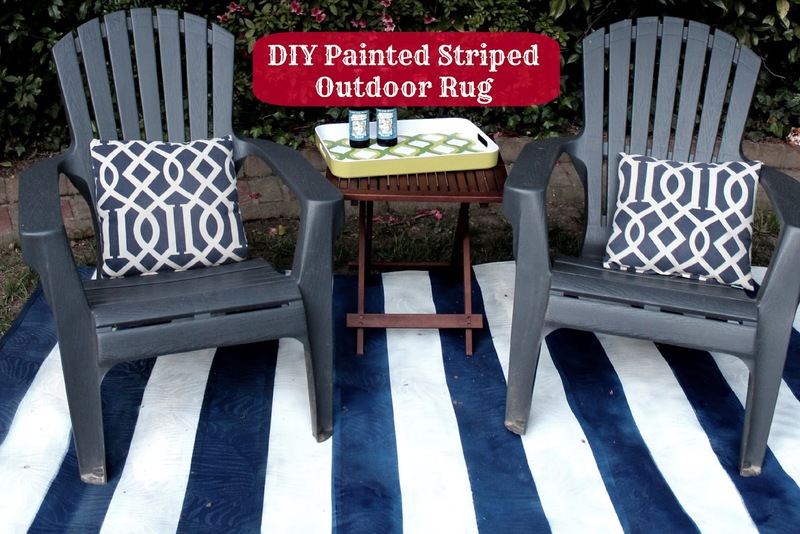 Originally, I was going to buy this inexpensive outdoor rug from Home Depot for $20 to tackle this project. However, when I found this 6 x 9 plastic-y rug while on a thrift outing for $12, I thought it would be the perfect rug to do some DIY painted stripes. This project took a little engineering so I brought in the reinforcements for a little help. To start, just measure your rug and decide how big your want your stripes. I went with 6 inches to give it a more bold wide stripe while still having the least amount of stripes possible (less taping!). I didn’t spend much time measuring and taping off. It doesn’t have to be perfect to be beautiful, y’all. I spray painted a section and left it outside in the rain for awhile just to be sure it wouldn’t peel off! I started taping off my stripes and then realized that since the background of this rug was not one of the colors I wanted to use, I needed to give the entire rug a coat of the Rustoleum Heirloom White as a base (used two cans for this project). This would help prevent having to tape each line off twice. Always looking for shortcuts! For the blue, I used Rustoleum Gloss Navy Blue (only one can needed). Oh yeah- and did I mention I used spray paint to do this? Is there ANYTHING you can’t spray paint? If you are a perfectionist, I would not recommend this project because it would actually take a lot of time to get it perfect. If you are OK with something that will last a year, that you know is going to be mostly covered with furniture, and only costs $20- then this project is perfect! Since the porch is nowhere near ready to be enjoyed, I pulled the chairs over from the fire pit to set this little area up in the backyard. Who’s ready for happy hour? This rug was featured on Knock-Off Decor! Heather, how pretty! I love the stripes, and that you did it yourself! Thanks for the note and for joining in on the fun! Looks fabulous! I need to make one for our deck for the summer. Thanks for sharing it! Perfect. And much easier on the pocket book. Hi there! I just found you from the link up. Happy I did! I love this simple little rug! Amd the fact you found it at a thrift store….wahooooo! Great project! Thanks for the invite! Just linked up! awesome. love the adirondacks and the fun drink tray! looks great, i definitely want to try something like this! Thanks! I would love to see your finished product! Jenna- you ROCK! Thanks so much! Wow! You make it sound so easy. I have seen painted rugs a lot, and wanted to do one. But I am scared of ruining it. Maybe I should start with a thrifted one too! Anything with stripes gets my attention. Thanks. I am also completely smitten with stripes these days. Love this rug! And that you were able to make such a big impact for so little! This rug is just perfect for summer! Thanks for sharing! Thanks! It does make me ready for summer! Ohhh I love this! Thanks so much for sharing at Give Me the Goods Monday! Hope you party with us again next week! Wow! Thanks Chelsea for the feature! 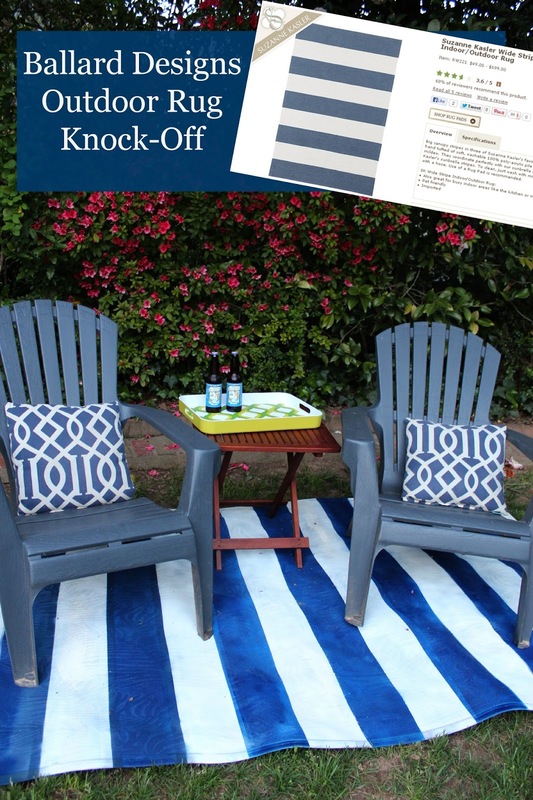 Great project for summer – this would look great on my deck – thanks for the idea! Thanks for sharing at Project Inspired – pinned it to our group party pinboard!! I love this painted summer rug Heather!! Thank you so much for sharing with us at the Pretty Things party this week, hope to see you again tonight for another great party!! I featured you today here! http://www.settingforfour.com/2013/04/10-indoor-and-outdoor-home-projects.html I also pinned it to my linky party pinboard! Thanks for sharing at Project Inspired Linky Party! WOW! Thanks so much for the feature! You just made my day! It looks pretty perfect to me! Your back patio looks great! It must feel so great to be ready for summer and all the fun entertaining. I can't wait to get mine in entertaining shape. I need to find some good thrift shop deals or it is going to take a long time to get everything done. Thanks! Thrifting definitely helped me pull our patio together. Good luck and thanks for stopping in!